Welcome to Dynamics Physical Therapy's patient resource about swimming. Stretching is an essential part of successful swimming. A good stretching routine can help to minimize muscle imbalances, prevent injury, improve your exercise tolerance and your swimming performance. The following stretching program is designed for swimmers who do not have any current injuries or individual stretching needs. If you have an injury, or a specific mechanical imbalance that may be holding back your swimming performance, your Dynamics Physical Therapy Physical Therapist can design a stretching program just for you. When your muscles are warm! Swimming is a dynamic sport so you'll need both dynamic and static stretching. Dynamic stretches form part of your pre-swim warm-up. Static stretches can be included at the end of your cool down or at other times to improve your overall fitness. General warm up (5-10 minutes). The aim of a general warm-up is to get the blood flowing to all parts of the body to be used during swimming, including the cardiovascular system. 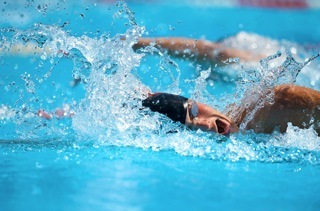 A slow speed, low intensity swim makes an ideal warm-up. You can use any stroke with the exception of butterfly (which tends to be high intensity) or a variety of strokes. If you prefer not to get in and out of the pool for a warm-up then stretch, you could warm up out of the pool using a walk or light jog, but remember to keep the upper body active by using your arms. Dynamic stretching. Gradually the speed and intensity of your movement is increased. See below for stretches which should be performed out of the water. Technical and speed warm up. For experienced swimmers, this includes high intensity, swimming specific skills. Drills should be kept short with recovery time between drills to ensure you are not fatigued too early. Beginners and recreational swimmers may choose to exclude this step, and instead use this time to practice turning, diving or stroke improvement. The pre-swim regime, including the dynamic stretching program detailed below, will take about 20 minutes to complete. Cool down. A cool down allows the body, in particular the cardiovascular system, to gradually return to its resting state. A cool-down reduces your chances of becoming dizzy or faint after exercise, allows any waste such as lactic acid that has built up during exercise to dissipate and may reduce your chance of having Delayed Onset Muscle Soreness (DOMS). Cool down by gradually reducing your swimming intensity, using an easy stroke, or walking in the water for about 5-10 minutes. Start with slow, low intensity movements, and gradually progress to full-speed, swim-like movements.